If you’re considering alternative energy resources, it’s time you consider making the switch to a home solar power system for your Sacramento residence. Saving money is one benefit of solar energy. You can help the environment with solar, reducing your home’s overall carbon-emissions. Finally, you can become energy independent when you choose solar power over traditional energy resources. No longer do you need to rely on a power grid. You’re in control of your energy. In this post, we’ll discuss how to determine the amount of electricity you actually use monthly and annually. This helps determine the size of the home solar power system you’ll need to completely power your home. It’s also possible to install solar energy to power certain components and appliances around the home. Maybe you want your system to only support your HVAC and lighting, but you’d prefer to have your appliances and other electronics on the grid. In previous parts of this blog series, we talked about a property’s solar potential, home energy efficiency, and purchase options. 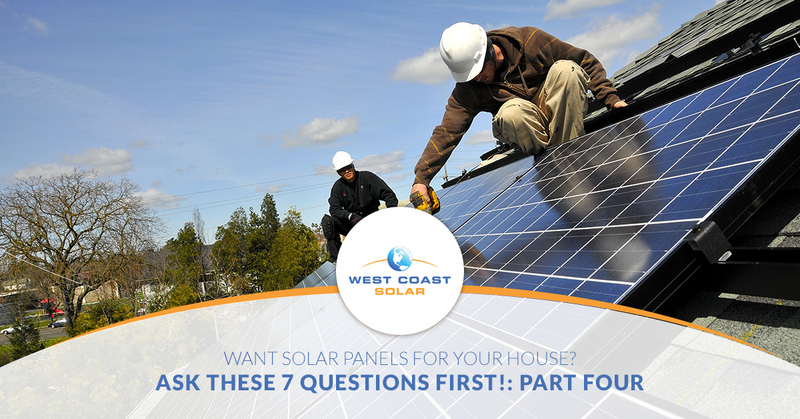 Are you ready to discuss designing a residential solar system? Give West Coast Solar a call today! We’re proud to serve Sacramento. Otherwise, continue reading to learn more. Question #4 – How much electricity do you use? Whether you decide to buy a solar power kit or work with a solar power company, you need to determine how much energy you use on a monthly and annual basis. This helps you estimate how large of a solar system you will need to power your home and life. Once you have the solar energy system size, you can then work with your budget to determine what you’ll need to do to purchase said system. It’s important to understand that your energy needs are unique. Between you and other Sacramento residents, you could be using less or more energy annually. Consider seasons, too. In the summer, you may run your air conditioning more often than your heater in the winter. Depending on your pattern of energy use, you may want a specific size and type of home solar power system to fit your lifestyle. In most cases, you’ll be able to find how much energy you use on your utility bills. Don’t have them? Give your utility company a call and ask. They keep records of energy use because that’s one factor used in determining your electricity bill. Furthermore, once you have your kilowatt-hours (kWh), you can compare it to estimated solar energy system’s power production numbers. Remember, if you have already determined you can make your home more energy efficient, you may be able to save some money with a smaller solar energy system; however, consider installing one that fits your current electricity needs—or future home endeavors that will require energy. At the end of the day, determine your energy usage needs and make decisions based on that. You’ve decided to make the switch to solar for your home energy needs. What else are you going to go green with in the future? Maybe you plan on adding onto your home? What if family purchases a home next door? How about starting a community renewable energy initiative? A home solar power system can supply energy to more than your house. It can charge a car, it can power landscape features, or, if you produce excess energy, you can sell it to your neighbors. Do you have a dream shop or workspace in mind? Consider the next 10-20 years of energy use and purchase a system that will support those eventual home additions or projects. West Coast Solar has been servicing Sacramento residents and their homes for years. We offer top-tier solar power services. As one of the more experienced solar power companies in the area, we know what it takes to get your system budgeted, designed, and installed easily and efficiently. We believe we’re doing more than delivering clean, renewable energy to our community; we’re creating a better future for the world. Join us in making the switch to solar power. Call our expert team today, and let’s discuss how we can get you started using renewable energy! In the next post, we’ll discuss how to obtain bids from solar companies, why getting multiple bids are important, and what to do once you have bids. Don’t forget to check out this entire blog series!